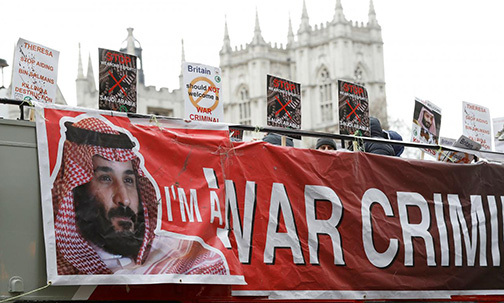 As the humanitarian crisis in Yemen drags on, the Saudi-led coalition has managed to buy off opposition in most of the media and among politicians in the West. Congress hereby directs the President to remove United States Armed Forces from hostilities in or affecting the Republic of Yemen, except United States Armed Forces engaged in operations directed at al Qaeda or associated forces, by not later than the date that is 30 days after the date of the adoption of this joint resolution (unless the President requests and Congress authorizes a later date), and unless and until a declaration of war or specific authorization for such use of United States Armed Forces has been enacted. Without the military hardware and assistance from the United States, as well as Britain, France and others, this one-sided war could not continue. The sophisticated aircraft flown by Saudi (and who knows who else) pilots require refueling in mid-air by U.S. military aircraft. It is clear that on their own the Saudi military is weak, even unable to control its southern border. Consider that there are no active Saudi troops in Yemen, only Yemenis hired by the Saudis and Emiratis to fight their fellow Yemenis. In fact, you’d certainly be forgiven for knowing nothing about it at all, as the war itself generates few headlines and the U.S. role, like it’s larger alliance with the horrible Saudi regime, is one of those things that everyone in power just takes for granted, like the sun rising or President Donald Trump tweeting crazy stuff. A non-binding bill passed last year by the House went nowhere. The news about Yemen’s war is trickling out with occasional news articles, most recently an opinion piece by William Hartung, director of the Arms and Security Project at the Center for International Policy, on CNN’s website. “Action to end US support for Saudi Arabia’s shameful military campaign in Yemen is long overdue,” argues Hartung. The hardware we supply has been used to bomb hospitals, schools and private homes, resulting in thousands of deaths. The crippling blockade imposed by the Saudi coalition has led to famine conditions, severely limited health care, a cholera epidemic and destruction of the normal economy. To top it off, three years of bombing and use of mercenary troops has yet to resolve the crisis. The figleaf excuse that is used as justification for this horrific war on a neighbor, sanctioned by the duplicitous UN Security Council, is to reinstall an unpopular and corrupt president Hadi, who was forced out by the Huthis. Hadi no longer has any credence in Yemen, especially the south, where a separatist movement aligned with the Emiratis has taken de facto control. While the UN has failed to stop the conflict, it ignores the fact of the war crimes demonstrated by its own Office of the High Commissioner of Human Rights. Saudi promises to rebuild Yemen after destroying it are hardly a measure of sincerity. You see the problem? When it comes to money, guns and power, we will cuddle up to any Arab autocrat, especially if our masters in Washington, however insane, feel the same way about him – and it will always be a “him”, won’t it? And we will wash our hands with them if or when they have ceased to be of use, or no longer buy our weapons or run out of cash or simply get overthrown.